“A lot of people say, ‘Oh, I’m going to move to Austin or Portland or some other hipster city to find cool stuff going on.’ We’ve got it; people just don’t know about it.” —Jacob Jolibois (left), host of the altBR podcast with co-host Abe Felix. Amid racial tensions, violence and a major natural disaster in Baton Rouge in August 2016, Abe Felix and Jacob Jolibois decided to start their own podcast. They had two main goals: to tell a different story about the city to counter how it is sometimes negatively portrayed, and to shed light on locals making a difference. Thus, the altBR podcast was born. 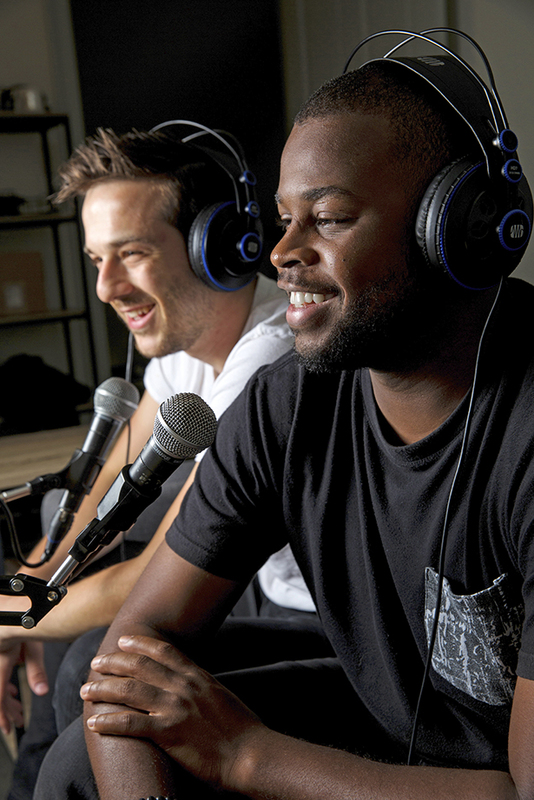 Jacob Jolibois, left, and Abe Felix work on their weekly podcast, which they started last August. Felix and Jolibois seem like lifelong friends, making jokes and sharing scoops of avocado during our interview at Southfin Southern Poké. But the two creatives have known each other for just more than a year. They met in the spring of 2016 at a video shoot and decided to partner on their podcast mere months later—leaning on Felix’s previous experience with audio and podcasts and Jolibois’ interest in hosting a show and helping the city. After nearly a year of weekly broadcasting and more than 50 podcasts under their belts, the Baton Rouge natives have interviewed local figures such as 17-year-old Wilson Global Initiative CEO Chance Wilson, Walls Project Executive Director Casey Phillips and Mayor Sharon Weston Broome. Felix and Jolibois record once a week in the offices of local advertising agency MESH, where Jolibois, 25, is the director of digital strategy. While Jolibois interviews the guests, Felix handles the production. Every Monday, the two upload their weekly podcast to the altBR website, iTunes, Stitcher and Overcast. The podcast’s guests have discussed everything from making Baton Rouge a more bike-friendly city to the power of hip-hop and spoken word. Jolibois says he initially started the podcast with the intention of not only launching a creative project but to inspire the city with positive stories and optimistic leaders during such a tumultuous time. He has found plenty of inspiration himself along the way. The two plan to continue broadcasting the show and figuring out the next steps for altBR as they go, Felix says. They have a list of figures they plan to interview in the future and are even pondering the idea of holding a live group conversation with previous altBR guests. Listen to altBR’s latest podcast episodes at altbr.org.